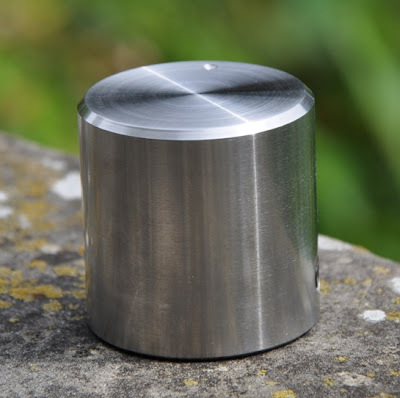 Beautifully machined from solid blocks of stainless steel and brass. My good friend Stefano helped me to source these from a very talented guy named Mario. Handcrafted in Italy! Two different materials to fit to different color schemes. 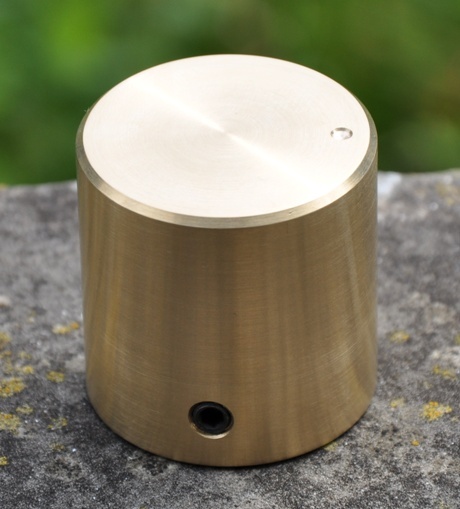 The knobs get fixed to the shaft of the switch with an allen key. These are the same as used already on the Octal Preamp. Thanks a lot to Mario for the beautiful work! This months tube is a very special type with some extraordinary properties, the 6HS5. 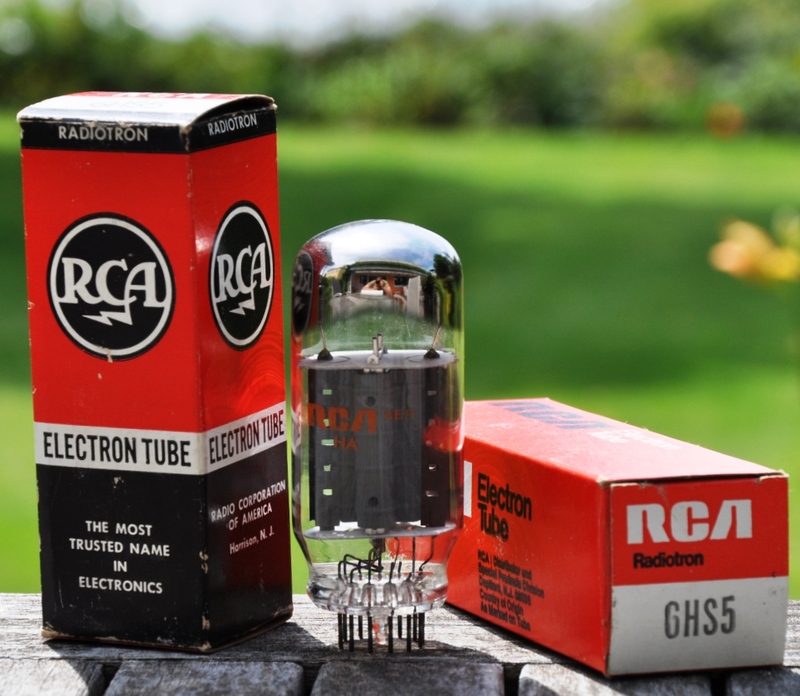 This is a quite 'modern' tube, developed in the 1960ies. 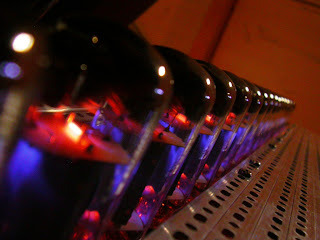 It's application was high voltage regulation for the acceleration voltage of color TV picture tubes. It was intended as a pulse type high voltage regulator. 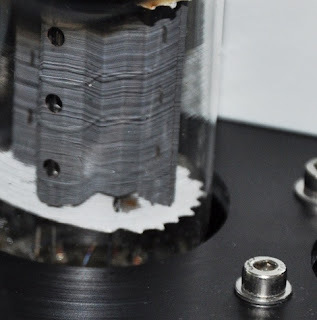 This tube is a beam triode. This means it has another electrode between grid and plate. Similar to beam power tetrodes, it has a beam forming plate. What makes this tube so unusual are it's extremely high amplification factor of 300 together with a transconductance of 65.000 micromhos! This results in a plate resistance of about 5kOhm which makes the tube usable for LC or transformer coupling. Thus it's full amplification can be utilized. The 6HS5 has a 12 pin compactron base. The compactron socket was introduced by General Electric. The purpose of the many pins was the possibility to integrate multiple systems within a single envelope. The 6HS5 only uses part of the available 12 pins. Control grid and beam forming plate are brought out to two pins. Only one of them needs to be connected. The beam forming plate can be connected to the cathode at the socket. There is a family of similar tube types which all share almost the same electrical parameters and have the same basing diagram: 6HS5, 6HV5A, 6HZ5, 6JD5. They only differ in the heater current and some have 35W plate dissipation instead of 30. I work mostly with the 6HS5 due to it's rather modest heater current of 1.5A at 6.3V. 30W seems ideal for the usage as an output tube. In single ended confuguration this would yield about 7W. More like 8W with the 6HV5As 35W max plate dissipation. These tubes are available in abundance from almost each reputable tube dealer at ridiculously low prices. Why are they so overlooked by the audio crowd? Well, nothing comes for free. While the tube has exceptional transconductance paired with a very high mu, it requires a rather high plate voltage to operate. In single ended Class A, over 1000V B+ is needed to achieve sensible results. This is probably the main reason why it is not so commonly used, besides the 'TV tube stigma' which causes many very interesting tubes to be ignored by audio designers. An important factor for audio use is the linearity. When I first discovered this tube in the tube manuals, I thought there must be some disadvantage why it is not used. It's probably not very linear. Back then I did not have any plate curves. So I ordered a few 6HS5 and tried them in a test set up. Linearity was exceptional given the other parameters of the tube. In the meantime I also found datasheets with plate curves. See picture on the right. The curves in the datasheet compare well with my measured results. 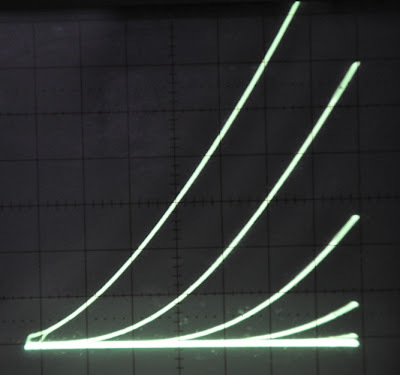 The picture below shows the plate curves of a actual tube, taken with a curve tracer. This is only a small section of the curves since the tracer only reaches about 350V. As mentioned above plate voltages beyond 1000V are needed for reasonable results. Still this small part of the curves shows that it is very well usable for audio. Plate voltages of 1200-1300V are still quite reasonable and DIYers who are used to build with transmitting tubes like 211 or 845 can handle this. Another difficulty however is the highish plate resistance. Measurements showed plate resistances above the 5kOhms mentioned above. So an output transformer with high primary impedance would be needed. Very few such transformers exist. Suitable would be the Tango FW20-14S with 14k primary impedance, or the Lundahl LL2735B with 16k primary impedance. 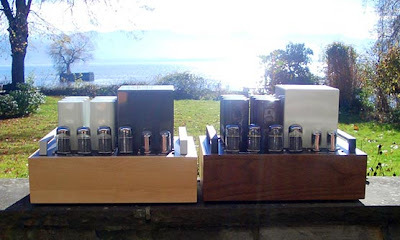 I will cover details about this family of amplifiers in an upcoming series of posts. But the 6HS5 is not only suitable as output tube. I already introduced it as a driver tube in my recent 211 amp. 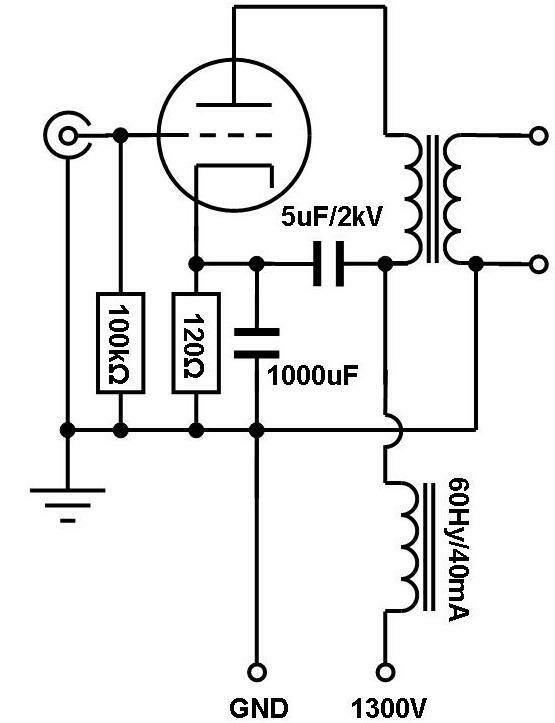 Here the high B+ voltage is already available in the amplifier, since the 211 has a similar B+, so the plate voltage for the driver could be derived form the output stage through a separate choke and decoupling capacitor. Other applications are possible as well. I have successfully used the 6HS5 even in phonostages. Both in single ended and fully differential configurations. Some care is needed to control microphony in a phonostage and it needs well filtered B+ and DC heater supplies in this application. But it is managable. A very versatile tube which provides many possibilities of use for creative DIYers! But how does it sound, you might want to know. The sound of an amp is not determined by the tube alone, but the whole concept. 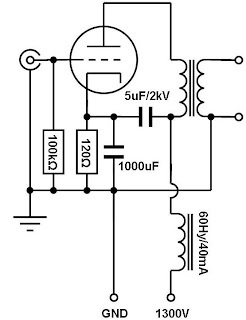 A simple circuit like this has much less parts in the signal path which can alter the signal. This gives the chance to build a very direct sounding amp with high resolution. Kind of like a single chassis speaker without crossover. The 6HS5 does not have the refinement and ultimate musicality of a directly heated triode. But it compensates a lot by the complete lack of a driver stage. Since it uses so few parts, better parts can be chosen and in fact this is mandatory to achieve a good result. The sound of the amp is ultimately determined by the tube, the output transformer and the ultrapath cap. Due to the low part count excellent results can be achieved with a moderate budget. An amplifier with directly heated output tube and the same power rating would require to spend at least 3 times as much on parts to surpass the sound level of such a 6HS5 amp. Since it is indirectly heated no elaborate filament supply is needed. It can be AC heated without any hum. In single ended configuration a well executed 6HS5 with a top quality output transformer like the mentioned Lundahl and paper in oil capacitors gives a very nice mellow tone with little coloration not very different from a 45, but with more power. This tube would actually also be quite suitable for a multi channel amp or for an active system. Multiple 6HS5 amps which share the same PSU can be easily integrated into a single chassis. I did build something like that for the European Triode Festival 2004, 4 stereo amps (8 channels) in a single chassis for a 4 way active speaker. This consisted of 4 SE amps using one 6HS5 each, two PSE amps with 2 tubes each and 2 parallel push pull amps with 4 tubes each. Even the linestage was integrated using yet another 6HS5 per channel. So 18 6HS5 tubes in a single chassis. The photo on the left shows an impression how that looked like. 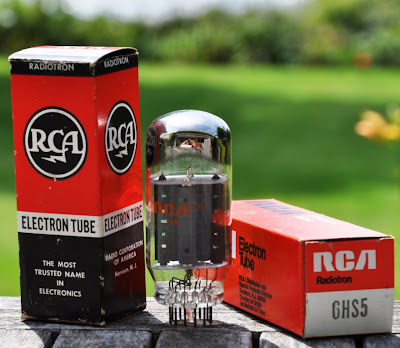 If you find this tube interesting and plan to build an amp with it, you should be aware of the dangers of the high voltage this tube requires. Only attempt to build such circuits if you have experience with high voltages. It is important to ensure proper creepage and clearance distances. Voltages over 1kV can 'jump' over small distances of air. For this reason I do not mount the sockets for the 6HS5 directly to metal plates. They are recessed below the plate. In addition I always drill the unused pins out of the socket. These are the pins 5,6, 8 and 9 which are on both sides of the plate pin 7. Also the internal wiring of such an amp needs to be carefully isolated. Addtional insulations sleeves over all wires carrying high voltage are recommended. Keep in mind that the plate swings far above the B+ voltage coming from the PSU when the tube is driven to full power. If the necessary precautions are taken, the 6HS5 will deliver excellent performance. It is very tough and will last long even when operated at it's plate dissipation limit. The tube seems also suitable for Class A2 operation with the grid being driven into the positive region. This way it can also be used with lower plate voltages. However I have not explored this myself yet. Stay tuned for upcoming articles around this tube! This is only a minor change. The high voltage for the phono section is better picked directly from the HV input from the PSU, rather than the linestage decoupling cap. The latter connection can result in some low frequency oscillations, depending on the DC resistance of the chokes in the filter chain. The scheme as pictured above is free from that. Of course the PSU needs to deliver an adequately smoothed supply voltage. I use a LCLC filtered supply with high inductance chokes. The last cap on the PSU output can be left in the PSU chassis, but can also be placed in the preamp section after the PSU input. The optional bypass caps are left out in this version of the schematic. I don't use them. With the inductance values of the plate chokes as shown, they are not needed. Of course experimentation with this is encouraged! I often have been asked if I could develop a phonostage based on my circuit philosophy but with variable EQ curves for mono records. I'm starting such a project now. The first one will be a mono phonostage, transformer coupled using two stages with EC8020. The same circuit as the recently presented EC8020 LCR RIAA phonostage. EQ will be adjustable by two separate selector switches for the bass EQ (turnover frequency and bass boost) and the treble cut (which selects the -3dB corner frequency of the treble EQ). This first variable EQ phonostage will be based on my best sounding phono circuit, using LCR networks. This means that there need to be separate LCR networks for the bass and treble EQ, since these are indivisually selectable. This is no problem since there are no integrated LCR modules available anyways for other curves than RIAA. So the networks need to be implemented discretely anyways. It seems that there had been a whole lot of different EQ curves before the RIAA standard was established. Trying to catch all possible curves with selectable LCR networks will be impossible since the LCR filters are quite big and expensive. Therefore I need to find a set of bass and treble EQ networks which provide a useful range which should cover a reasonable range of mono records. 4 to 5 settings maximum seem to be feasable for both bass and treble EQ. Since both can be selected individually this will yield quite a view useful combinations. With LCR networks it would be impractical to have the bass boost increasing down to 0 as it would require coils of infinite inductance. So for practical reasons there will be a shelf introduced at around 25Hz for settings 1 and 2. There are other frequencies around. Some of them are quite close to frequencies in the list above, so as an approximation the nearest setting could be used as a compromise. These are my initial thoughts on the EQ curves. I would appreciate feedback from people with knowledge in this field. Would you consider this selection as being reasonably representative? Keep in mind this is to cover the most mono records of the 40ies and 50ies. Exotic and rarely used curves for really old 78s are not required for this project. Please email me or leave a comment on the blog with your feedback. In the last two articles, I presented some titles from the extreme ends of the spectrum of my music taste. Today I will write about a piece which falls somewhere in the middle. 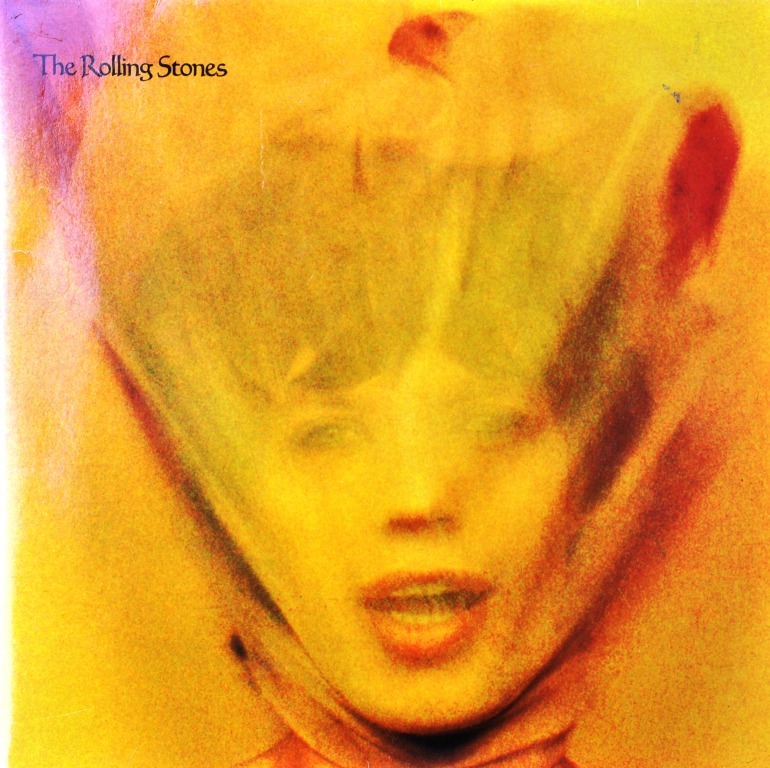 A ballad from The Rolling stones, the song Angie. 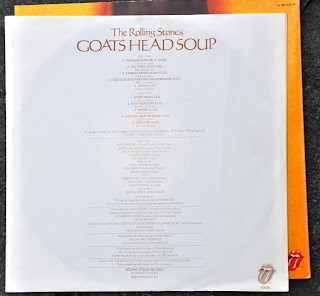 This is a song from the album 'Goats Head Soup'. I have never been a big Stones fan. Sure I liked their music and they are one of the greatest rock bands. From an audio geeks point of view, the recording quality of most of their albums is quite mediocre, but that shouldn't really count anyways, at the end, what matters is the music. Goats Head Soup is also nothing special in terms of technical recording quality. The vinyl I have is from the seventies, from the era when most records where cheaply made, thin and flimsy. Yet on a good system it is very listenable. Especially the song Angie has some interesting details on the recording. Whenever I listen to a new system or a new component, this is one of the tracks which I like to listen to. The first time I heard this track during a HiFi demo was a long time ago. I was a teenager and wanted to upgrade the speakers of my very first stereo system to something 'serious'. This was one of the pieces which was played and the system reproduced it really well, at least to my standards back then. I bought the speakers. In the years after that, I kept experiementing with different audio systems and followed what the glossy HiFi magazines preached: 'high resolution' with good imaging. This was during the 80ies. Many records were almost unlistenable on these systems, including this one. 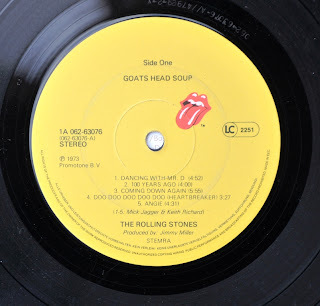 It was regarded as a sign of the good quality of the stereo, since it clearly showed the flaws of the record. It took me a while until I realized that this was the wrong path. A system should be able to play 99% of your favorite records really well, no matter what their 'technical' qualiry level is. A good system does not show the weaknesses of recordings with a magnifying glass. It should show their strengths. After I got into vaccum tube amplification and especially DIY, I learned about the correct way of music reproduction. Trying to get the best out of every record, focus on the music, ambience and emotions, not the technical sound. So what is so special about this title, besides that it is a beautiful ballad and passionately performed? The song opens with a guitar play and Jagger's vocals. The rest of the band supporting him in the background. About half way into the song there are some 'background sounds' which are easily overheard. A poor system might not even reveal them. As my systems got better, these got more clearly audible. So what the fuzz about such details? I just wrote that the music is important, not such background details. Well, when you listen closely you will realize that as the band plays on, the other musicians get so much into the mood of this song, that they start to hum und sing along with Jagger. 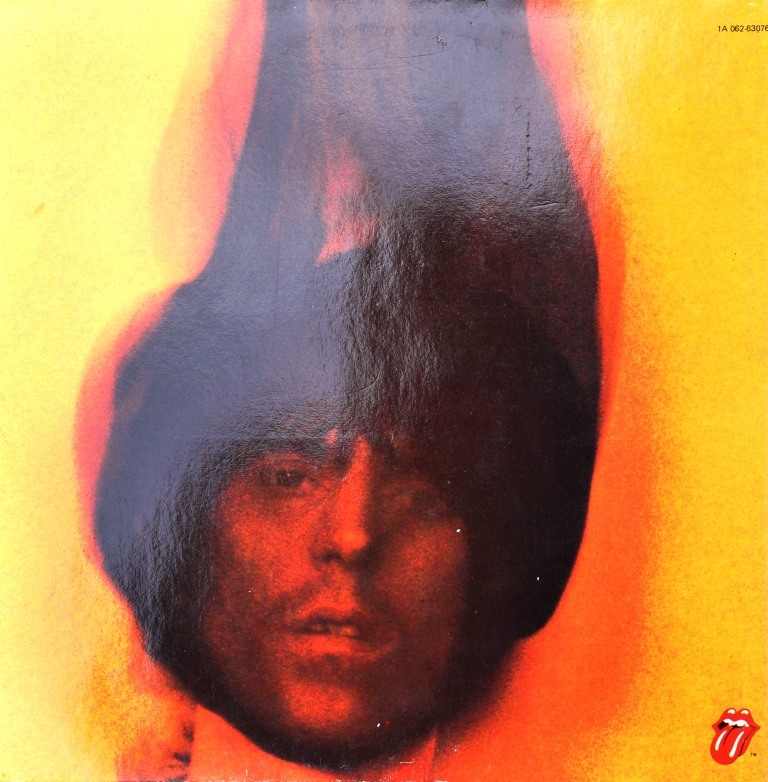 While it might not have been intentional, it is part of the atmosphere and emotions present in the studio, when they recorded this album. Maybe a silly little detail, but I like to pull out this album and enjoy the ambience of this particular situation. It is fun to demo it to friends and see their reaction, when they become aware of it. Many records contain such things. Explore your record collection, especially those which you think are nothing special. They might contain some gems. 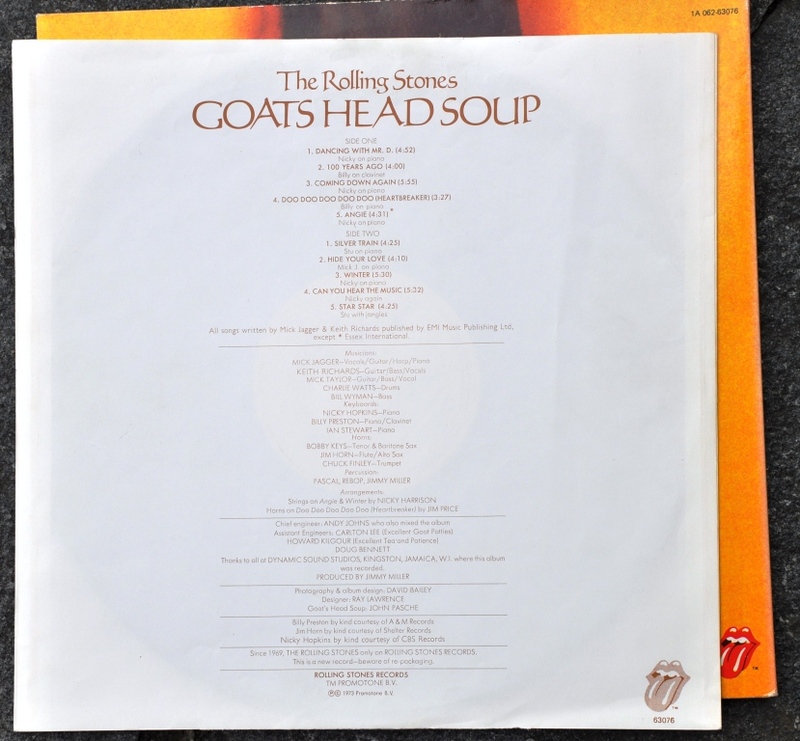 Savor your Vinyl! 'Der Dritte Raum' is not really a band since there is only a single person behind that name, Andreas Krüger. Only during live acts he is accompanied by another musician. The english translation for 'Der Dritte Raum' would be: 'The Third Room'. Trommelmaschine translates to drum machine. 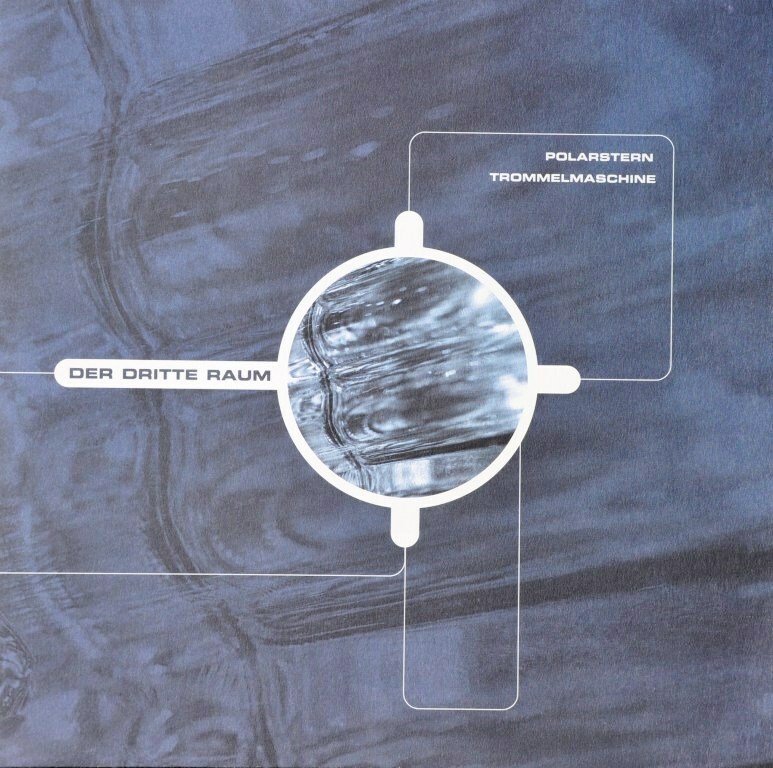 The title Trommelmaschine is actually the B side of the single which is called Polarstern. As the name of the track implies, this is a piece which is composed of samples and sequences of actual drums, mixed with electronic sounds. It has a very fast and driving rythm. The piece is very minimalistic. There is no melody as such, the theme of the title is just rythm. The way it is composed of different samples of drums and bass sequences, is quite sophisticated as the rythm goes through some interesting structural changes throughout the piece. As you can see, I not only like Jazz and vocals from the 50ies and 60ies but also more current music styles like techno, trance, house, etc. Trommelmaschine is a good representative of the techno and house music scene of the late 90ies, when this record was released. I hope you enjoyed this article about some different kind of music. 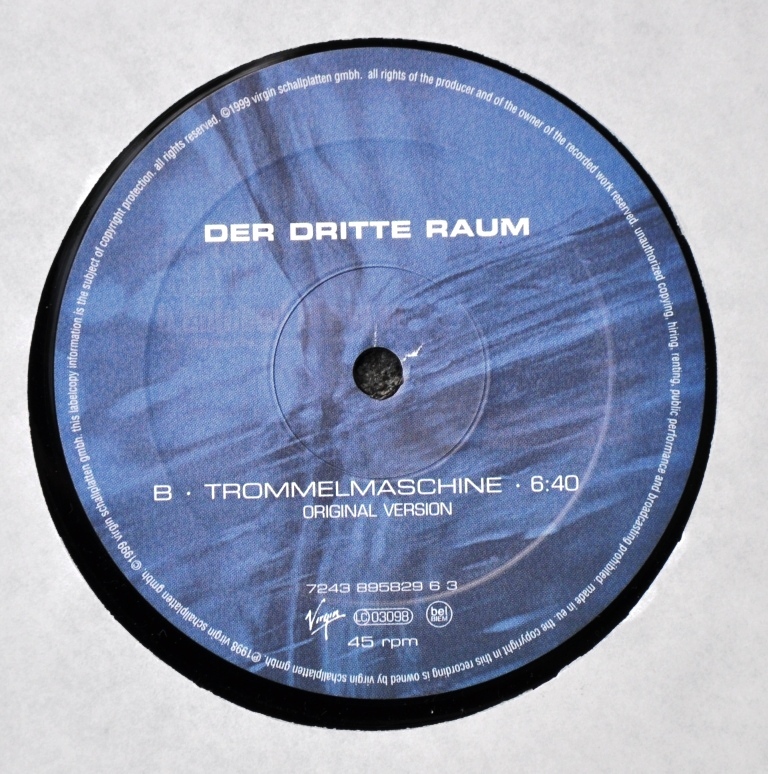 This and other records of 'Der Dritte Raum' can still be found on vinyl and of course on CD too.